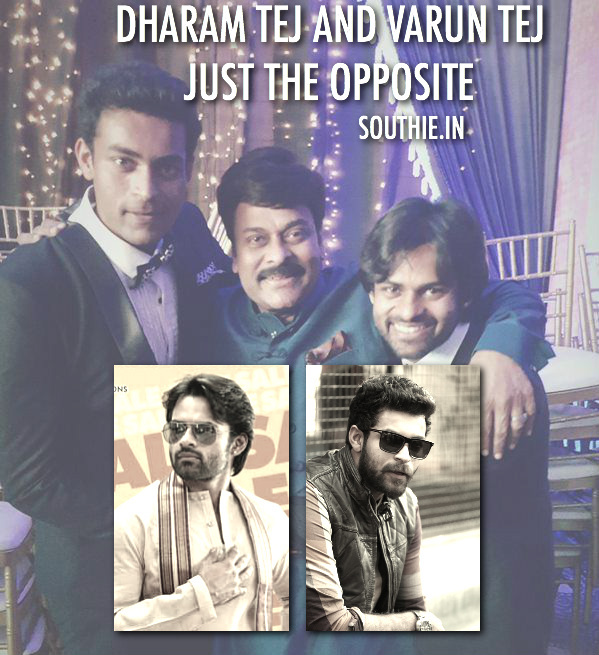 Home/NEWS/Sai Dharam Tej and Varun Tej are just opposite in planning. Sai Dharam Tej and Varun Tej are just opposite in planning. Sai Dharam Tej who looks like Chiranjeevi in his younger days takes heavy inspiration from Megastar, while Varun Tej is totally different. Sai Dharam Tej who looks very much like Chiranjeevi in his younger days, takes heavy inspiration from his movies. He has also used the title of Supreme in his movie, and he is also called as the Supreme Hero just like Megastar Chiranjeevi was called earlier in his career. The recent news of SDT using the title Gang Leader for his next movie was just over the top, after remixing many hit songs of Chiranjeevi’s in his movies. Then there is Varun Tej, who is not using any reference of Megastar in his movies, none of the Megastar songs or dialogues have been used in Varun Tej’s movies. Though Varun Tej has the equal opportunity to use Megastar’s Hit songs, he has refrained from doing so. These two budding stars are making sure they follow different paths in their planning, but some day for sure Varun Tej has to use Megastar’s reference in his movies, and Sai Dharam Tej has to stop using so many references in his movies.